Why should the controversial Land Acquisition Ordinance, seeking to replace the 2013 Act, be turned into a full-fledged Act? 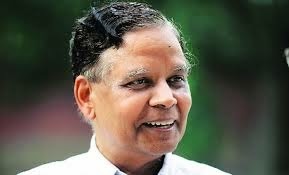 Explanation put forward by Arvind Panagariya, vice-chairman of the Niti Aayog -- set up by Prime Minister Narendra Modi replacing Planning Commission -- is: Because large majority of farmers, 90 per cent to be exact, allegedly do not having any special liking for farming as their occupation which could earn them income. A Colombia University economist and a supporter of free market "wizard" Jagdish Bhagwati, in a new article in a top business daily, Panagariya has quoted survey conducted by NGO Lokniti to say that only 10 per cent of farmers "say that farming gives them good income." Panagariya's take on the Act comes amid Central government showing early signs of conceding concessions in the amendment Bill it has introduced to replace the the 2013 Act in Parliament, as even BJP allies do not want to go with it. Basing his argument on Lokniti survey, Panagariya says, "When asked whether they like farming, 28 per cent of the farmers reply outright in the negative. Among the 72 per cent who reply in the affirmative, a whopping 60 per cent say that they like farming because it is their 'traditional occupation. Most revealingly, 62 per cent of all farmers say that they would quit farming if they could get a good job in a city." Panagariya further quotes to survey to say that "the responses of women and children in farmer households reinforce this picture. When asked if agricultural income is sufficient to fulfill livelihood needs, 67 per cent of the women reply in the negative. And a solid 76 per cent of the children of farmers say that they would prefer to take a profession other than farming." Comments the top economist, "With the spread of education and enhanced access to information on the developments around the world, the young in farmer households have the same aspirations as their counterparts elsewhere in the world." Therefore, he thinks, "In assessing the proposed amendments, the question we must ask is whether they are consistent with the ambitions and aspirations of the young, including those from farmer families; with the promotion of social goals underlying the projects for which land is to be acquired; and with the interests of the farmers whose land would be acquired." Heavily coming down on critics of the proposed amendments to the land acquisition Act of 2013, Panagariya say, "They contend that any benefits to non-farming entities -- whether they be school-going children, patients seeking hospital care, households looking for affordable housing, small businesses or large corporations -- would be at the expense of the farmers whose land is acquired. But they neglect the fact that the amendments are a win-win proposition." Characterising social impact assessment and consent clauses of the 2013 Act, which have been dropped like a hot potato in the proposed Bill, as "lengthy" and "time-consuming", Panagariya estimates that if put in practice the law would take at least five years for any land acquisition to happen even if the acquisition "proceeds flawlessly with no legal challenges, NGO agitation or bureaucratic delays." And since few land acquisitions have such a smooth ride, "the actual time taken would be much longer", which "deter even the most determined governments from undertaking a project that requires a private entity to play a role whether solely or in partnership with a public entity", the economist contends. Given this framework, it wasn't without reason, Panagariya believes, that land acquisition for public private partnership (PPP) projects and for private companies for public purpose came to a standstill since January 1, 2014, when the 2013 Act came into force. "After coming to power, when the present central government conducted a consultation with state governments, chief ministers from the BJP as well as non-BJP states overwhelmingly complained about the obstacles posed by the consent and social impact assessment provisions of the law", he says.